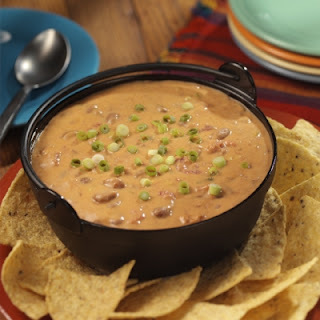 This post contains the original Ro-Tel® dip recipe plus three others, and, at the bottom, several links to related recipes. This recipe may be prepared using a microwave or in the top of a double boiler. In a 1.5- to 2-quart microwave-safe bowl, combine ingredients; cover and heat on High until cheese is completely melted, about 5 minutes. Watch closely, stirring after 2.5 minutes. Serve warm with tortilla or other corn chips. In top of a double boiler, combine ingredients over Medium heat, stirring frequently until the cheese is melted. When serving this dip (or a variation) at a party, pour the prepared dip into a small slow-cooker set on Low. This will keep the dip warm and at the ideal consistency for several hours. For best results, stir the dip occasionally to prevent hot spots. Discard hot dips after sitting at room temperature for two (2) hours or longer. Otherwise, refrigerate any leftover dip (it's also good cold). Put all ingredients in a 1.5- to 2-quart microwave-safe bowl. Cover and heat on High until cheese is melted, about five (5) minutes. Watch closely, stirring after three (3) minutes. Serve warm with tortilla chips or crudités. Slightly adapts a Velveeta® recipe on the box. In top of a double boiler, combine ingredients over Medium-Low heat, stirring frequently until the cheese is melted. Slightly adapts recipe from Ro-Tel® . Melt Velveeta®, covered, in crockpot on Low setting. When the cheese is completely smooth and melted, about one to two (1 to 2) hours, turn crockpot to High setting just long enough to warm through other ingredients. Meanwhile, sauté the green onions and red bell pepper in the butter until soft. 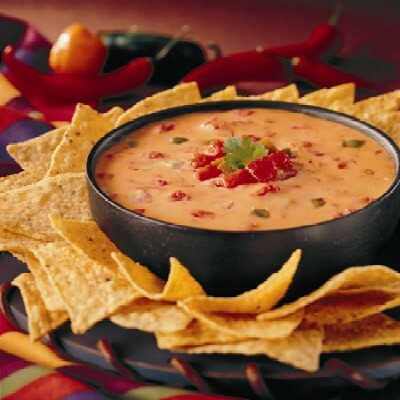 To the crockpot with melted Velveeta®, stir in the sauté mixture, Ro-Tel® and Monterey Jack and warm through. Add crab meat and combine. Reduce heat to Low and cook for one (1) hour more. Then, stir well and, if you desire, season now with hot sauce. 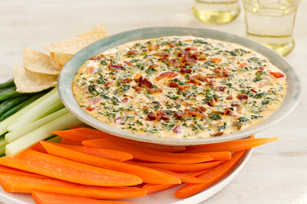 Serve and keep this dip warm. Offer crudités or your favorite crackers, as you prefer. 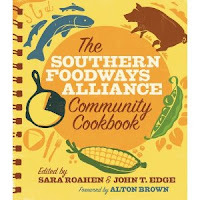 Adapts Southern Foodways Alliance. The Southern Foodways Alliance Community Cookbook. Ed. Sara Roahen and John T. Edge. (Athens: University of Georgia Press, 2010), ? ?.